A highlight at Austrian extrusion machinery maker battenfeld-cincinnati’s booth at the October-held K2016 show was when India’s Jain Irrigation Systems placed an order for a complete extrusion line to manufacture large polyolefin pipes up to 2,500 mm in diameter. This was only one of the orders placed at the show, according to Gerold Schley, CEO of the machine maker. A highlight at the booth and a part of the large-diameter pipe extrusion line for the Indian customer was the new solEX NG extruder series, of the “next generation” (NG) with a processing length of 40D. 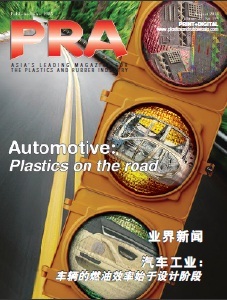 Featuring a completely re-designed process technology concept, it has a barrel with internal grooves in combination with a matching screw and grooved bushing geometry optimising the extruder’s processing attributes. The result is a lower melt temperature by up to 10°C along with a completely changed axial pressure profile in the feed zone and barrel, which leads to an overall reduction of the load on the system and consequently a cut in energy consumption of up to 15%. 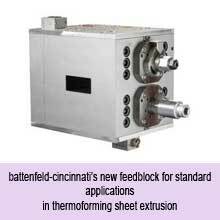 With its FDC (fast dimension change) system, battenfeld-cincinnati says it has broken new ground. This pipe dimension change system operates fully automatically across a wide range of diameters and allows not only a change of external diameters, but also of pipe wall thickness during running production. It is synchronised from pipe head to cutting unit, so that dimension change can be started by the push of a single button. FDC lines cover a bandwidth of diameters, ranging from 90 to 630 mm, which it says is currently unique on the market. The FDC pipe dies with an adjustable melt gap are available for diameters of up to 1,200 mm, and FDC vacuum tanks, cooling tanks, haul-offs and cutting devices for diameters of up to 1,000 mm. 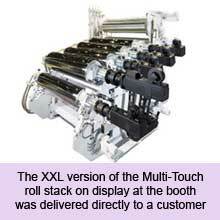 “At this year’s K, the interest in our solutions not only for pipe production but also for the packaging industry was particularly strong,” Schley continued, highlighting the XXL-Multi-Touch roll stack, for packaging at high speeds of more than 110 m/minute and outputs of up to 3,300 kg/hour (PET) and 2,700 kg/hour (PP) for thermoforming sheet extrusion. 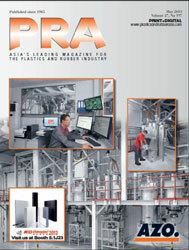 battenfeld-cincinnati also offers STARextruders, a special machine series for PET processing. A novelty in the battenfeld-cincinnati product portfolio is a special three-layer feedblock for thermoforming sheet production, which is completely manufactured in-house in Bad Oeynhausen (Germany). The concept of using a pin with a milled distributor curve to achieve an optimal layer thickness distribution so impressed customers that eight orders have already been placed. This is an added incentive for the machine manufacturer to offer this type of technology for 5, 7 and 9-layer feedblocks in future as well. Apart from its new solEX NG single screw extruder series, the conEX NG twin screw series for PVC pipe and profile production also celebrated its premiere. These new extruders, too, were created by a complete re-design of the processing unit: a longer pre-heating zone and an optimised screw geometry ensure higher outputs with significantly reduced shear stress and machine wear.